Overview Advancing the "state of the art" technology in RF contact mechanisms, "ULTRA" provides the opening and closing forces associated with conventional entry doors. The standard lockset supplied with the "ULTRA" complies with applicable Americans With Disabilities Act (ADA) Requirements and presents the image of a conventional office lockset. The lockset is also lockable from the outside only, just like a "closet or storage" lockset. In the open or closed position, the "ULTRA" maintains the appearance of a door, not a bank vault. When used for Medical applications, this "typical or normal" door enhances patient comfort and security. Door Leaf The door consists of a solid core (or light weight core, application dependent) leaf. The sides and top of the door leaf are banded with a brass contact angle which is electromechanically bonded to the shielding media that is applied to the door face. 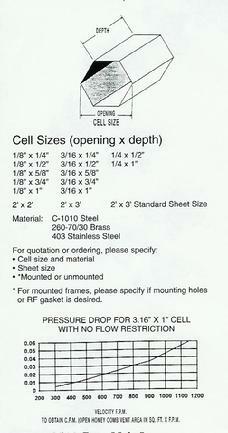 A brass contact angle is mechanically attached at the bottom of the door. The faces of the door are supplied with a high pressure plastic laminate (HPPL) which is "Natural Oak" in color. Other colors/finishes available upon request. Door Frame The door frame consists of a RF interface frame which the door jambs, sill and head are attached to. The jambs and head are laminated hardwoods and finished to match the HPPL that is supplied on the door leaf. The door leaf and door frame are furnished as a complete assembly and is available in a "flush" or "raised" sill configuration. Hardware The "ULTRA" is supplied with all hardware in a US26D finish and is Clear Anodized (which is Satin Chrome). The hinge mechanism is a commercial grade, full surface, security hinge. The hinge system is designed and installed so there is no contact between the RF seals and the hinge plate. The lockset supplied is a "storeroom or closet" which is lockable from the outside only. The lockset meets the Accessibilty Guidelines of the Americans with Disabilities Act (ADA), the Uniform Federal Accessibility Standards and ANSI 156.2, Series 4000, Grade 1. Passage, closet set, entrance or office type locksets and push/pull plate assemblies are also available upon request. Threshold The "ULTRA" is supplied with a solid brass threshold for both the "flush sill" and the "raised sill" configurations. 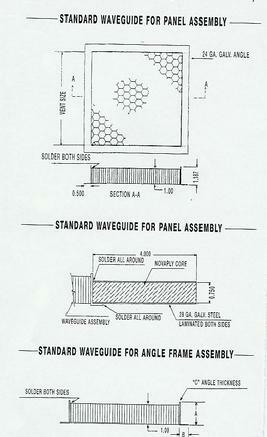 The threshold is electro-mechanically attached to the door frame assembly sill. The threshold is available in single or dual tapers (for new or existing construction). 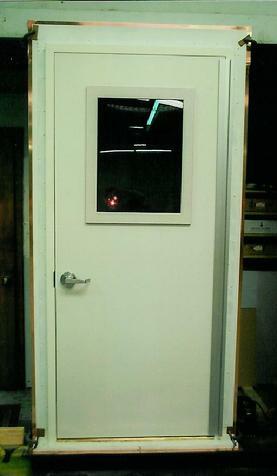 Standard Door Size The "ULTRA" is provided as a 4' 0" X 7' 0" standard size which priveds a clear finished opening of 3' 10" X 6' 11". The "ULTRA" is available in other single or double door sizes upon request. Operating Force The "ULTRA" is designed to be opened or closed with less than 15 pounds of push/pull pressure. RF Contacts The "ULTRA" is furnished with a single row of low pressure beryllium copper electrical contact strips. The contacts are installed recessed in the door frame jambs and head section for a "flush" appearance. The contacts located at the bottom of the door are attached to a removable brass mounting angle. The contacts are designed and installed to be virtually maintenance free(since no lubrication of the door is required and they are protected within the door frame jambs) and should replacements be required, a phillips head screwdriver is all that is required. The "ULTRA" is also available in a HIGH PERFORMANCE VERSION which utilizes two (2) sets of electrical contacts. Warranty The "ULTRA" is furnished with a standard two (2) year warranty. Optional five (5) year and "enclosure life time" warranties are also available. Architects, engineers and companies searching for cost effective shielding are turning to Shielding Resources Group for the most up-to-date selections, and solutions for their needs. Flectron metallized nonwoven fabrics have been developed specifically for low performance (40 dB-60 dB) architectural shielding. Flectron metallized fabrics applied directly over most construction finishes (applied with a non-toxic adhesive), result in an economical solution for your shielding requirements. The use of Flectron materials will avoid unnecessary down-time, unpleasant toxic fumes from soldering, and an easier, faster installation, resulting in a lower cost relative to other options for retrofits and solutions which are on a tight time frame. TV studios, stage theatres and convention centers are increasingly using wireless microphone systems and computer controlled equipment with RF communications. This equipment is sensitive to disturbances by RF emitters in the area, requiring these large buildings to be shielded to ensure uniterrupted, problem-free operations. These facilities are generally very large, with floor space on the order of several thousand square meters. A key need in these applications is durability, as these facilities must be in service for many years. The Flectron Nickel/Copper Polyester fabric used in these applications is preferred over other metals, such as copper, silver and aluminum. Accelerated aging tests include Battelle Class II and Class III, Salt Fog, and cyclical heat and humidity have been completed for Flectron products, and the test data exhibit superior environmental performance over other standard shielding materials. As the prevalance of wireless communications and high speed microelectronic devices has increased dramatically in recent years, and is forecasted to continue to grow, many other types of facilities must now also be shielded in order to achieve desired operational results. These include": telecommunication facilities (switching, briadcast, studios), computer billing/transaction centers, secure rooms and industrial EMC test rooms. Flectron is the ideal product for use on walls, ceilings and floors of these facilities. Contact SRG for more details. Our unique manufacturing process includes applying a thin coating of 50/50 (Pb-Sn) lead-tin solder mix to the raw strip material. The thickness of the coating is extremely critical and must be held within .0015"-.002". After the strip material is formed, cut to the desired length and assembled as a sheet, it is placed in an oven. Under a controlled set of parameters, the temperature is raised until the solder is allowed to flow via capillary attraction. Once cooled, the sheet becomes a bonded honycomb matrix offering structural and RF integrity.